Finding affordable childcare can be a challenge. Because of this, many people are looking for a job that they can do with their kids. While many of these jobs are done from home, there are a few jobs that allow you to bring the kids with you. The following employment ideas include jobs where you work for another person and business opportunities that the whole family can work on together. In the case of the businesses, it’s recommended that a family try out the idea before the parent or parents make the decision to quit their job.mmFor people who have little money for start-up costs, there are a lot of financing options. Business loans are the most common financing route, but they typically require a person to have a good credit history. A bad credit business loan can be taken out by people who are in this situation. The majority of day care centers, as well as many private schools allow their workers to bring their kids to work with them. In the case of many day care centers, the employees are offered free care for their children as part of the benefits package. Depending on the center’s rules, the children are allowed to stay in the same room where their parent works. Many schools allow the children of their teachers and other staff (such as cafeteria workers) to attend classes there. In the case of private schools, this is considered to be one of the main benefits of the job by many of the people who work there. While children are often not allowed to be in the same classroom in which their parent teaches, they are often just a few feet away. Parents who choose to work from home and/or who own their own business have a lot of flexibility with their schedules and they can often plan to bring their kids to work with them. For example, there are a lot of home-based craft and baking businesses that are operated out of homes. Start-up costs for most craft businesses typically just consist of the craft materials or ingredients themselves as well as some basic advertising. Depending on their age and ability, young kids can sort materials, attach price tags, and even assemble simple parts. Older children can help out by photographing the items made and creating listings for them on internet sites such as etsy and craigslist. Kids of all ages can accompany their parent to the flea markets, swap meets, and farmer’s markets where the parents sell their goods. In fact, many parents site these places as a good way to teach their kids about the basics of a retail business. Kids learn good math skills, as well as how to interact with other people and a variety of sales skills. My son happens to be one of those lucky people who can eat whatever he wants and never gain weight, something he certainly didn’t get from me. Although he constantly reminds me of that fact around Easter each time he grabs another jelly bean, I remind him that not being overweight doesn’t mean you can eat whatever you want. Candy is fine in moderation, but you have to resist temptation around holidays, especially Easter. Of course, like most kids, whatever I say goes in one ear and out of the other, so I learned that distracting him from the candy using Easter activities was the best bet to avoid a sugar frenzy. I’ve personally done chicks and dinosaurs, but you can make nearly any animal out of dyed eggs. Simply dye the eggs according to the color of the animals your kids want to make. Get some modeling clay that dries in the air and non-toxic glue and paint. Use the modeling clay to make the animal’s feet and other features, such as beaks and ears and attach the pieces to the egg with the glue. Once the glue dries, have your kids paint other parts on the eggs to complete the look, such as eyes or color patterns. Baskets can be decorated using whatever theme your kids chose. My son loves cars, so we went out and bought foam shapes. We painted the shapes and made cars by cutting pieces to sizes we needed and gluing the pieces together. Once the glue dried, we painted each one. After the paint set, we glued the cars all over his basket. Foam shapes will work for most projects. You can make a princess theme and flowers for girls and dinosaurs and cars for boys using foam shapes. Talk to your kids to get other ideas for basket additions, such as stickers and glitter. The baskets can be used around the house for holding different things; we keep an especially good one by the front door as a key dump, and there’s another in the bathroom which holds fruity soaps. You could also decorate an Easter tree, which is another craft variation that is popular in many places, especially Canada. A lot of family members give my son money at Easter. 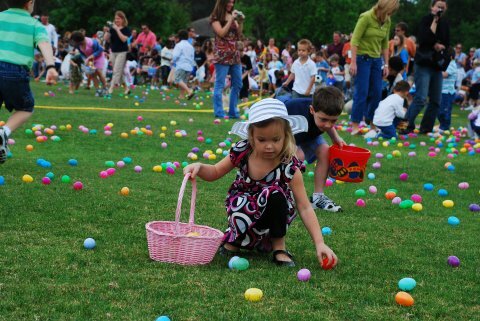 Putting change in a plastic Easter egg or at the bottom of the basket in the grass is considered good luck. However, I prefer to use these Easter windfalls to teach my son about saving money. Get a plain, unfinished piggy bank or other coin bank from a crafts store. Use stickers or glue on foam shapes representing items he wants to buy onto the bank and have your child put all his Easter money into that bank. Talk to him about saving for items he wants instead of spending his money all at once. Since Easter happens right around the ISA season, it’s a good time to think about opening a junior ISA for your kid and it fits with the saving theme. Even though your child may not understand the reason behind a tax-free savings account, they will understand you’re using a junior ISA to save money for them for the future. A junior ISA allows you to save money tax-free and invest the money in the stock market if you want to do so, so you can help your child pay for their education and other life necessities later. What other tips do you have for a healthier Easter?